Where Is the Account Number on a Check? To set up electronic payments or direct deposit, you’ll need your checking account number. The easiest way to find that number is on a personal check (but there are other solutions if you don’t have checks). This layout applies to most personal checks, but business checks and bank-printed checks have a different format - see below for alternative locations. You can generally find the account number on a check by locating the following symbol: ⑈. The digits just before that symbol are your account number. For an example, see the image on the top of this page, where the account number is highlighted in yellow (or view a larger image). If you need to provide an account number, there's a good chance you'll need to provide other details from the check as well. Your account number by itself is not sufficient to create a link to your bank account for direct deposit or automatic bill payments. Routing numbers: the number on the far left is generally your bank’s routing transit number (RTN) or American Bankers Association (ABA) number. That nine-digit number identifies your bank, but it does not identify your specific account at that bank. Check numbers: the set of numbers on the far right should be a check number, which is just used to identify an individual check for your own accounting. 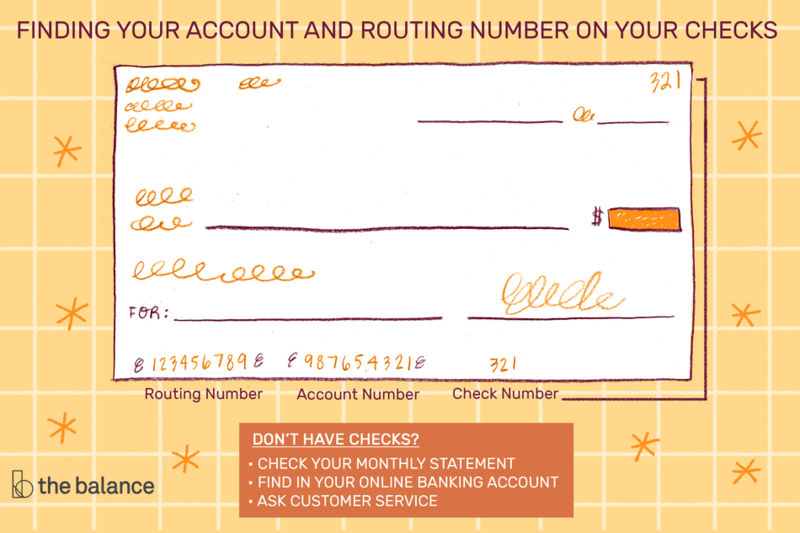 A check number does not reference your bank or your account (it’s just a unique identifier for every check you write, helping you track your spending and balance your checkbook). Check numbers are not crucial for processing payments – they can be re-used or used out of sequential order without major problems. The format described above applies to most personal checks. However, checks that come from businesses (such as payroll checks) and checks that have been printed out by your bank might have a different format. For example, checks mailed by businesses or sent from online bill payment services often have account numbers as the third set of numbers from the left. To further complicate matters, those checks sometimes show account and routing numbers that are different from the numbers on your personal checks. If you try to copy your account number from a check printed using your bank’s online bill payment tool, you’ll get an account number that does not map directly to your individual account – it goes to an account that your bank uses for bill payment instead. You won't be able to use those numbers to link your account for direct deposit, ACH payments, or wire transfers. It’s best to use a recently-printed personal check to find your account information – or just contact your bank and get the details. If you have any doubts, contact your bank. A customer service representative can tell you everything you need to know to get your automatic payments set up. They’ll need to know exactly which account you want to use because ABA numbers may vary depending on where you opened your account. You might also be able to find this information online when you’re logged into your account (look for a direct deposit form or instructions for setting up EFT or ACH). Getting the account number right is worth a few minutes on the phone with customer service. Consider the consequences of an improper setup: you might not get paid on time, and you might end up bouncing checks or missing payments for important things (like your mortgage or student loan, which can lead to serious headaches and expenses). Get it done right the first time and then let everything run on autopilot – that’s the whole point of signing up for electronic payments. It’s easy to find your account number on a check, but what if you don’t have any checks? The next best place to look is your monthly statement. In some cases, your account number is partially hidden (especially if you view statements online), so you may end up having to call or chat with customer service.